Hard drive failure is unpredictable, so answering the question of how long hard drives last will inherently comes with a lot of caveats. Short answer: That being said, if you just want a quick rule of thumb for how long you can expect the hard drive in your laptop should last, we’d say you should be prepared for disk failure after three years of use. Long answer: A handful of studies on the lifespan of hard drives might give you some clearer indication, but they still aren’t very helpful. Many of the hard drives tested do not fail at all. These drives are also kept in controlled environments and don’t undergo the same conditions as, say, your laptop drive. What brand is the hard drive? What do you use it for? Running applications, viewing media, or storage? Is it frequently shaken, vibrated, or bumped? How hot does your computer get? These factors and many more can affect the lifespan of a hard drive. All of the discussion below, unless otherwise noted, refers to standard magnetic disk drives, not solid state drives or hybrid drives. Which hard drive brands last the longest? 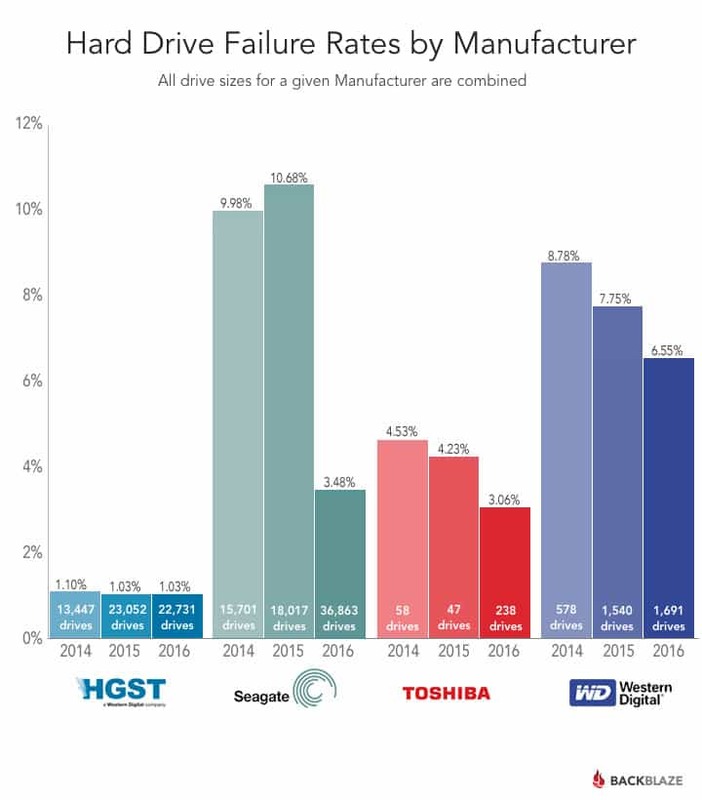 Short answer: HGST (rebranded name for Hitachi) drives generally last longer than Seagate and Western Digital. We don’t have enough definitive data on Samsung or Toshiba to make a conclusion about them. Long answer: In 2014, cloud backup company Backblaze started posting statistics on the failure rate of over 27,000 hard drives and their respective brands. In short: Hitachi’s failed the least, followed by Western Digital. Seagate had the highest failure rate by far, with 13 percent of Backblaze’s 1.5TB models failing over the course of a year. When new results were published one year later, however, Western Digital surpassed Seagate and failed the most of the brands tested. Toshiba results were included in these results despite the relatively small number of drives tested. Toshiba scored roughly the same as Seagate. HGST was still the most reliable overall. In 2016, the latest report, Seagate returned to its position as the hard drive brand with the highest failure rate, followed by Western Digital. Toshiba beat both of them, but Hitachi held firm at number one with the lowest annual failure rates. Note that failure rate varies between models as well as brands. The 1.5TB models from Seagate fail far more often than the larger models from the same brand tested by Backblaze, for instance. Why does Backblaze measure the failure rate per year instead of the age of the hard drives when they fail? Because most of the drives they tested didn’t fail at all. Four in five hard drives were still going strong by the end of each three-year test. 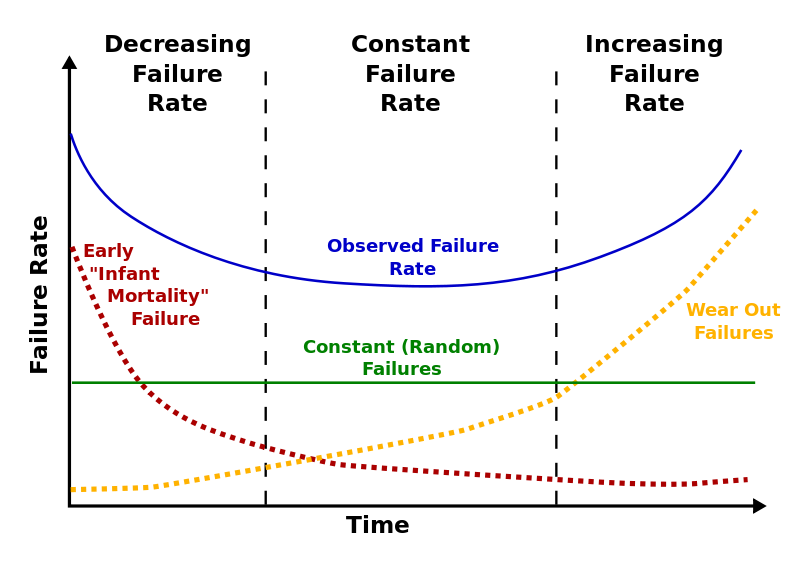 Long answer: A useful way to visualize the cause of failure rates in hard drives is with something called the Bathtub Curve. The Bathtub curb tells us hard drives have a high rate of failure in their first few days, weeks, and months of use. This is usually the result of factory defects. A hard drive might be dead on arrival, for instance. Some call this the hard drive “infant mortality” rate. If a hard drive has no factory defects, it will typically endure over the next two or three years without issue, which means the failure rate falls. By year four and five, the failure rate is well on its way back up again. These failures are due to general wear and tear, but pinpointing a specific cause has proven troublesome for researchers. Google measured activity (also referred to as “utilization”) levels by analyzing the total time spent reading or writing data on the drive over a period of time. Drives that were utilized more failed significantly more in the first three months, but then failure rates dropped off in the subsequent months and years. The failure rates remain even and even less than the less-used drives until year five, when drives with higher utilization levels start failing more often again. Google attributes this to what it calls the “survival of the fittest theory,” in which the causes of failure that are associated with higher utilization are more prominent early and late in a drive’s lifetime. In short, utilization might not be causing hard drive failure, it just makes the actual causes of failure surface more quickly. In Backblaze’s report, the company notes that some drives were incompatible due to what they surmised was vibration. 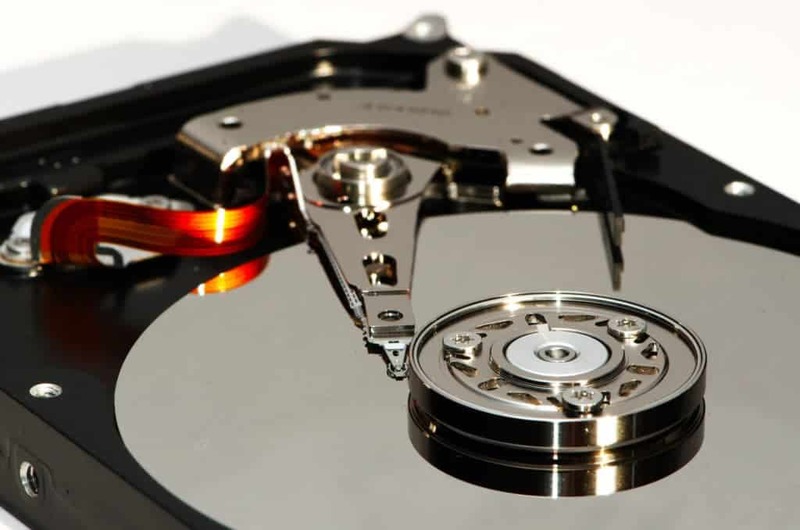 While the impact of heat and activity is still inconclusive, vibration, bumps, drops, and shakes can definitely shorten the life of a hard drive. Can I trust the MTBF? A hard drive’s MTBF, or mean time between failures, is an estimation of how long a hard drive will last. Some hard drive manufacturers advertise this figure as a way of showing how reliable a specific drive model is, which usually ranges between 1 million and 1.5 million hours. That’s more than double, and in some cases more than tenfold, than what a manufacturer states in the MTTF. Short answer: Back it up before it fails. Long answer: Dealing with hard drive failure requires preventative measures. Trying to recover data off of a hard drive after it has failed is a difficult and expensive endeavor. The best practice is to regularly back up your drives to a separate location, either a physical drive or the cloud. For most of your media files–documents, pictures, videos, downloads, etc–a standard cloud backup service like IDrive or Crashplan should get the job done painlessly. Cloud backup ensures that your files will always be available whenever you need them. While an external hard drive could just as easily fail as the hard drive you backed up onto it, cloud backup services keep copies of your copies in a variety of locations, so you needn’t worry about failure or theft. Most cloud backup providers use apps that will automatically back up your files as you add, edit, and delete them, which makes the process all the easier. If you want to back up your operating system, settings, and programs, things get a bit more complicated. We sometimes call these “bare bones” or “full system” backups. They come in two varieties: images and clones. Cloning creates an virtually identical hard drive to the original, complete with files, applications, operating system, settings, boot record, allocation table–everything. If your hard drive fails, just swap in the cloned drive and you’ll be back up and running as if nothing ever happened, albeit back in time to the point when you created the clone. Creating an image is similar, but everything is saved to a large compressed file that can be saved to an external hard drive. It can be stored on a normal storage partition instead of installed and it takes up a lot less space. The downside is that restoration is a bit more complicated. You’ll need the boot disc that comes with your operating system–either a CD or a thumb drive, and run the emergency restoration program to get things working again. See also: How to put a disaster recovery plan in place for a small business. My plucky Seagate 3tb was purchased in 2011, and the little fella is still going strong. will hgst wd merger degrade quality of hgst drives? “How long do hard drives last?” Please! Your description of the Backblaze report is very unclear. Does this show failures within each year, regardless of age? I.E., one drive may be 3 mos. old, another 3 yrs. old? Or were all purchased that same year? You also mention, “…the end of each three-year test.” With results posted for each of three consecutive years, I can’t compute this. Does each year’s result span the previous three years? Do they then overlap? Regarding the Google utilization study, someone at “BYTE” magazine (probably Jerry Pournelle) used to say that if hardware was going to fail, it would fail fairly soon; otherwise, it would probably last forever. I’d say any drive over 4 years old is doing very well but is at a higher risk of drive failure and data should be handed over to a new drive whilst it’s still going. After six months of use, retire the older drive and resume a backup strategy of that data either via external backups or cloud storage. I’ve noticed that the article used is about four years old now, but they haven’t updated it. I suspect the failure rate of drives plateaus out than what is theorised as the failure rate towards years five and six, but that’s only speculation. I for myself have 2tb seagate enterprise drive in year six and I do error checks and haven’t found no errors. Must of been a Tuesday build.